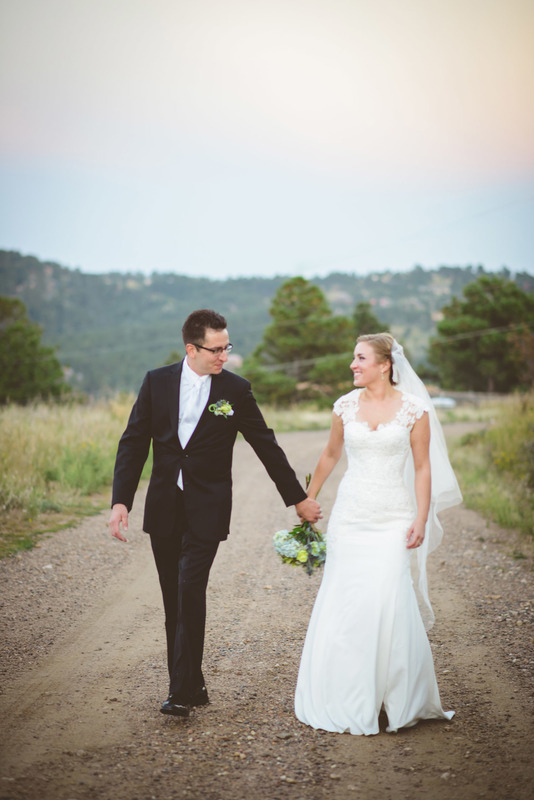 Joanna and Jason’s mountain wedding in Golden, Colorado is on of our favorites! This cute couple was not afraid to have fun on their big day, and the end results is a wedding that looks like it was a total blast! Our anna bé bride looked fabulous wearing "The Farm" gown by Lela Rose. We absolutely love how the guipuire lace is sheer across the shoulders and frames her so beautifully! And that Sara Gabriel veil, absolutely to die for. See the stunning photography by From the Hip Photo below. Jason and I really wanted a natural and organic wedding celebration without too much pomp and circumstance — we hoped our big day would flow as easily as our relationship did. What we ended up was so much more than we even envisioned. After getting engaged, we agreed that it was crucial to find a venue with extraordinary views and a relaxed elegance to set the stage for our wedding, after which we needed to find photographers whose work inspired us and who could get on board with our more candid style. I was never the type of girl who dreamed about or envisioned her wedding day in any way, so when it came time to actually plan a wedding, I was overwhelmed at all of the choices and options I had in every single category. We had the venue, we had photographers, but then it came time to start thinking about THE dress. The team at Anna Be was incredible. They worked with me for over a year to create the absolutely perfect bridal look, inspired by a truly stunning gown that I was even more excited to put on before walking down the aisle than I was when I first found my dress. After I found my bridal gown, everything else seemed to fall into place over the next few months, due in large part to some final organization from our wonderful wedding planner, and before we knew it, the wedding weekend was upon us! We had a lot of family and friends travel in from all across the country and it seemed as if everyone pitched in to help put the final touches on the whole day. We all finished the DIY bits, like the centerpieces, place cards, props, various accessories as well as signage and Jason even built our chuppah/wedding arch, which was set up and decorated by our dear friends before the ceremony. All in all, it was the perfect day for us. Jason and the boys got to race go carts and goof around, while the girls and I had an ongoing dance party throughout the day to keep the nervous energy at a minimum and in the evening Jason and I came together to commit ourselves to each other as we enter the next phase of our lives. It was a day we will never forget!